Need more variety of cuts of meat. $50 for each cut is very high. A great restaurant starts with great food. And Chophouse passes this test with flying colors. Everything we ordered was just wonderful. And they do have some dishes that are not standard on restaurant menus. But a great restaurant also has wonderful service and Chophouse servers and other personnel treated us in a wonderful manner. It was clear they were to serve us and it is not a bad thing to feel pampered once in a while. Our server Val took great care of us. The Chophouse can stand up with the best of restaurants one can find in Chicago, San Francisco, or New York or other big cities. I hope they keep maintaining their quality. It was a great dining experience. Would return again! Great experience. Enjoyed every step of our visit, from wine at the bar to dessert and coffee after an extraordinary dinner. Even the leftovers were delicious. This was the second time we've been to the Chop House in GR. The first time was amazing. This time we felt as if we were being rushed out the door from the time we sat down. We ordered drinks with the waiter hovering as we decided on wine. Then he immediately asked about salad soup and appetizers. We asked for a minute to decide and he was back in 30 seconds wanting to know what we decided. He tried to get us to order our entrÃ©e at that time and we asked for a bit of time. He was right back again in 30 seconds. The entrÃ©e was delivered as the appetizer was removed and even with dessert the entire experience was over in one hour. We were never asked if we'd like coffee. Our bill was delivered to our table before the dessert was delivered. The appetizer was great. The asparagus were like rocks and tasteless. I wanted a filet medium rare but he waiter said it would be better medium as the middle would still be red and warm if medium. I got medium and it was way overdone for my taste. I'd get medium rare and not listen next time. CrÃ¨me Brulee was awesome. Wine was excellent but waiter was in too big of a hurry to ask if I wanted more. With reservation at 6:30 I suppose the waiter wanted to turn the table but a customer was lost in the process. We dined for a birthday celebration! \nThe appetizer (crab and lobster cakes) a bit overdone.\nThe wedge salad was excellent as was the lobster bisque. There was a nice assortment of breads. \nService throughout the evening was excellent!\nThe entree selections (filet of beef) were delicious although a bit more rare than medium rare. The Bernaise sauce was a nice addition. The mushrooms were very good. If you want to relax at dinner and feel the comfort of home, then go to Chop House. Outstanding food, great selection of wine and other adult festive beverages along with cuisine that is just top drawer this is the place to go. My husband and I do not get out much and twice a year we look forward to spending our birthdays at chop house. Normally it's a wonderful experience however this pass time wasn't as expected. I ordered the Beef Wellington as done every other time. After returning home that evening, within a couple of hours I became pretty sick. I had not eaten before so think possible food poisoning or the steak may not have been cooked enough. By morning I was OK but definitely not how I wanted to spend my birthday. The service and the food as usual where outstanding. \nI find such a friendly environment as soon as I step into the Chop House. \nIt's just a great place to relax and unwind after a long day. Wonderful birthday dinner. Will return on another special occasion. Best service and BEST STEAK in town! Tried a few new dishes this time, all were outstanding! Our permanent home is in Savannah, Georgia and we also have a condo in downtown GR, and the Chop House is our 'go to' place for dinners on special occasions as well as a few other times a year. The food is outstanding, and our service on the 20th was just sensational. Our server carefully recommended wines for us and he is extremely knowledgeable. For any steak lovers visiting Grand Rapids, head across the street to Chop House from Ruth's Chris, and you will not be disappointed. My husband and I ate here for a late Valentine's Day Dinner. He had the Filet Mignon and I had the North Atlantic Salmon. We shared a side of the Garlic Smashed Potatoes, everything was phenomenal! Phenomenal. That's all there is to it! Dinner with significant other added to an excellent weekend in GR. I ordered a cowboy steak medium- was very tasty, but portions were not even medium rare but rare. My wife ordered a filet medium well. The steak per her was overdone, tough and tasteless. I hate to complain; I really enjoyed my other two visits to the Chop House in past years. Wonderful experience. Great birthday dinner. Travis was an awesome server! Very attentive staff. Immediate assistance with coats, and directly to table seating per our reservation for 6. Beautiful restaurant. Server was fabulous and so was the food, beautifully presented. Ambience was wonderful and not too noisy considering the busy evening. No rush by staff. Very enjoyable by all in our group. The Chop House must be the best restaurant in Grand Rapids! Everything from the food to the service was more than I could have wanted! Thank you! Great appetizer, steak and sides selection and unique craft beers that are made specially for the Chop House. Prior to this, the craft beer selection was small and never changed. More variety in local Michigan Craft beers is always a plus. As always the Chop House is fantastic. If it's a special occasion and I could pick, hands down The Chop House would be it every time. The food is always wonderful and the atmosphere is very romantic. Everything was great. The issue we did have was resolved professionally and with tact. T his was or 13 dinner with you for Valentine's Day. This is first year we reserved on the Saturday before Valentine's though. We've been married 10 years. We got engaged on Valentine's here and it was or first Valentine's dinner together so the Chop House has been a part of our romantic life every year. Very special to us. But,. No place, not even your competitor across the street compares. We have typically dined on average at the Chop House 3-4 times per year. It was always a 'treat' to look forward to. However, the last experience may be our last. The service was rushed and made us feel as if we were being hurried. I felt our server was in favor of rushing us out of there. He asked me if I was still working on my cocktail, in which I said I was, as it was half full yet. I kid you not, literally 2-3 minutes later, as I was conversing with my party, the server returned to grab my drink. This time he didnt bother asking if I was finished. He also, grabbed the bread and I asked if I could keep it to finish. His response was, 'trust me, you wont even miss it'. Granted, our food was quickly presented to our table, but I did want the bread too. Then to end our dining experience, he picked up my plate that I still had 1/4 of my filet left on it. This time, I did call him back as I wanted to take the leftover scraps to my dog. Pretty embarrasing position to call back the server for my plate that I wasnt finished with. I felt like the service was not worth putting up with even if the food is top notch. Unfortunately, our dining experience was disappointing and not the 'treat' it used to be. The food was outstanding as always and matched in quality by the servive. A favorite of ours for birthday celebrations! Awesome , we will be back. Thank you very much for a great eventing. I absolutely LOVE this place! Food and service are top notch. Excellent as always! First time for my date, and he LOVED it!!! Wants to go back soon. I brought my grandmother here to celebrate her 85th bday and that was her first visit. She really enjoyed it! Our server John was the best, he's actually waited on my husband and I a few times and I'm glad he was there that night.\n\nWe will be back soon! Great food, cooked just right! Music wasn't overpowering and we were able to talk to each other without raising our voices. Can not express how amazing this place is. The manager Jake was awsome. He treated us great and our waitress sarah was very professional and gave us excellent service. Au gratin potatoes were salty and not very good. My lamb chops had more gay than meat. The cream corn was very good. Overall a bad meal. Service was ok. Would not return. Chop House is still our favorite for celebrating bdays because of their 1/2 special. Other than that we wouldn't go because it's so overly priced. My boyfriend and I dined at Chop House before the GVSU Presidential Dance. The service was excellent and also the food. We will be making future reservations. The Sea Bass was phenomenal and the spinach as a side dish was superb! Went to the Chop House for my husband's 40th Birthday and had an amazing experience. Overall service was it's super attentive best, steaks were fabulous, and we had a wonderful dining experience. This is a birthday tradition for us, and I have never failed to be impressed by the level of service, even on a discounted meal. You will continue to earn our business. Also, THANK YOU for the creamed spinach and kale. Even with melt in your mouth filet, this was by far the best bite of the meal. Great food and great service as always. Nice spacing between courses and made for a great evening. Reservation was for 7:15 and we were not seated until 7:50 PM. Our waiter John was not the best. He acted very disassociated from why he was there. Long time between courses. Not the best experience that we have had there. Quite disappointed actually! Outstanding service by John!!! The food was fantastic!! We are currently on the Whole 30 food plan and had great options!! Again John was very helpful!!! We will be going back after our 30 days are up for dessert!!!! We went for dinner before going across the street to DeVos Hall for a show and had plenty of time. The Chop House never disappoints. The food is impeccable. Service was outstanding. Excellent wine selection. Best Restaurant next to my own. The food was incredible and the atmosphere was just right. I was very happy with the wine selection and our server did an excellent job. Great service, wonderful food, very pleasant ambiance. My first Visit to The Chop House was 1/21/17. I was really excited to try it after all the hype that I heard. After all, its supposedly one of Grand Rapids best steak houses. In a nut shell I was quite disappointed. My friends filet was over, my veggies were amazingly bland, and the Wellington was not something I'd ever order again or recommend to anyone. Ruth's Chris is across the street and everything was better there excluding noise level. \n\nBest wishes! it was great, just great. Olde style steakhouse with a regal vibe. We enjoyed another great dinner prior to an event at DeVos Hall. Our server, Kim, was not only attentive to our meal service, but had a welcoming wit at the same time. Kudos to the entire staff in the front and the back of the house!\n\nP.S. We love the cheesecake desserts! Dined here to celebrate a birthday party. The quality of service provided by the staff, chefs and the management was exceptional. A special thanks to Harry, the general manager for making it all happen. Furthermore, Matt and Harry helped me with last minute changes and even offered me an upgrade. That was a very special night. Definitely dining here again. Keep up the good work. The Sea Bass was outstanding!!! !\nIf I could rate it 1-10 I would give it a 15! We dined December 29th with my son and family who were visiting from out of state. All service was top notch which I have come to know from the Chop House. The four of us had a great time, our waiter was superb (Travis) and the food was incredible as always. We had several appetizers, great wine, and for the first time in over 20 visits, I tried something other then the filet mignon... Travis suggested we try the bone-in filet and it was delicious! The sea bass and diver scallops are something everyone should try too! And, the Creme Brulee is the best anywhere. \n\nTravis was very attentive, friendly and courteous and easily picked up the tempo of the table. Everything was prepared perfectly, presented and served in 'unison' and we laughed and had the best of nights. No matter how good the food is, the server is what makes or breaks the night. Chophouse is our very favorite place to dine or to celebrate special occasions, and has been our choice for years. We even chose it over the 1913 Room at the Amway Grand when it was in business across the street. Beautiful setting, outstanding cuisine and our server, Catherine, was exceptional! Attentive, polite, and caring staff. Another memorable meal at The Chop House with excellent choices on the menu. The food was excellent but we were disappointed with the table we were seated at. We were there to celebrate our anniversary and it was not romantic at all. We were seated right next to the station were the servers entered and tabulated their orders . That really prevented it from being a special evening for us. The food was really good and didn't have to wait forever for it. Dining area was very nice and upscale. My filet was served as ordered as well as my husbands ribeye. The sides were extremely good as well. We had asparagus and cheese potatoes...yum!\nThe wait staff was very prompt with getting us whatever we needed.\nThe only thing I would change is validating parking, or a refund on parking. That would have been a nice higher end perk to a very nice evening in an awesome restaurant. My wife and mother in law used the reservation for a birthday celebration. The food was excellent and my mother in law really enjoyed it as it was her first time. Always enjoy going for Birthday deal of 2 for 1. We love sitting in the booth for dinner and enjoying dessert downstairs on the couches. I had the oysters as a starter. They ran from stand size to small, with the quality less than good. Realize it's Michigan in mid winter, but if offered, I expect better quality. Pricey but food and service was outstanding! Even the cocktails were terrific. Great service and food. A little pricey but worth it for a special occasion! Wonderful waiter. Delicious food. We will definitely be back soon. It was a little dark however. Best restaurant in town - hands down. Never disappoints, from the food to the service. Been many times; great service but not this time. Waiter preoccupied and non-attentive. Told him it was my cousin's birthday upon arrival and his response was 'you better have ID and be able to prove it'. Never said Happy Birthday. I ordered a rarer filet but the one I was served was thin, and my cousin who orders medium well had a thick filet, so we asked if perhaps they got them mixed up. Waiter insisted they were fine, and I again asked if they got mixed up as rare is usually thicker, and then he ordered us to cut it down the middle to look. We really didn't want to cut them down the middle as they cool off faster, but he stood there and repeated that we needed to cut it down the middle, which we did, and as we thought, steaks had been served to us wrong so we swapped. \n\nPotato came, but no vegetable, so asked waiter and he said we didn't order it. We got it at end of meal, and he didn't charge, but was too late to eat it at that point. Waiter assumed we were done and ready to check us out, but we told him we were having desert. Again, he seemed in quite a hurry; maybe he was supposed to get off soon and was stuck serving us? I said we would be having our favorite, the creme brulee. He only brings one... we asked about the other and he said 'you just said 'we are having the creme brulee, so I thought you were sharing'. So we shared.\n\nHe was not mean, he just seemed like he was so preeoccuped that he could not get our orders straight, make them good, check on us, and seemed to rush us.\n\nWe left about a 50% tip regardless since one meal was free and we figured he had to share with the other staff assisting and did not want to short them. Hope we never get this waiter again. Wonderful food and service! Would highly recommend for fine dining in downtown GR. Unfortunately our second experience at the Chop House wasn't as great as the first. The entres we selected - were not available. Our waiter forgot to tell us. The timing of us receiving the food was off - we had the smallest pieces of bread I have ever seen. When we couldn't get the ribeye we were charged extra for our meal. My husband ordered his meat between medium to medium well - it was served rare and had to be taken back to be cooked. Unfortunately what we thought would be another awesome meal - wasn't. It is too bad. Our annual Christmas Eve dinner was, as usual, exceptional. The holiday ambiance, coupled with the impeccable service, and delectable meal was a tradition that we will continue to partake in for as long as we are able to. As the price is something we can only afford on a special occasion, it's well worth a once-a-year trip for anyone. Chop House is very nice for special Occasions however; be prepared-for the prices. Everything is alacart, steaks are very expensive. Don't expect to spend less than $180.00 for a dinner for 2. Example: a glass of wine $11.95. This from a the same bottle/brand I can buy at Meijer for $19.00. Not criticising. Just a fact! Appetizers and sides were delicious and service was amazing. But Chop House is known as good for steaks. Both my husband and my steaks were not cooked right. He ordered medium and was medium rare after server confirmed how medium was supposed to be cooked. I ordered medium well, server stated pink throughout which was good with me. My steak was well and super dry. So if going for steaks, skip steaks and get appetizers and sides. I highly recommend the Chilean Sea Bass and the Dover Sole. Our umteenth visit and once again this place delivers.. excellence at every level. The Chop House never fails to impress, from ambience to food quality to wine selection. Such civil and not overly obsequious service. The lobster bisque and french onion soups are fantastic. The bread is just right. We arrived at 515p for a 730p show and it worked out perfect and we did NOT have entrees, just soup, salad, dessert, and coffee. As always, the food was outstanding and you can't beat the price on your birthday--50% off dinner for two. I had filet mignon which just melts in your mouth, partner had dover sole which he said was excellent. Service is always attentive without being overbearing or too stuffy. \nReservations highly recommended. Food and service were excellent, we requested a quiet table thru open table to celebrate our anniversary but that didn't happen, restaurant was very busy and the noise level was quite high. For the money the servings could have been a bit more generous on the entrees, I had the bone in filet (very good) and my wife had the Dover sole. We both had the lobster bisque, yum! And shared a salad and desert, we did not go home hungry. Disappointing visit. I special ordered a cake for my sister's 60th birthday a week in advance and they dropped the ball. I even called the morning of our visit and they could not confirm the cake was made. Instead, they gave us a cheesecake as an afterthought with messy writing and they charged me $45 for it, twice as much what the cake would have cost me. After spending $450 on dinner, I expected better service than this. I sent the restaurant a message to complain but I have yet to be contacted by anyone. I doubt I will ever return to this establishment. A very good meal, very attentive staff. It would be the type of place for a celebration. The reservation process seems weird. We had to go earlier than we wanted because they were booked, yet there were many empty tables at the time we really wanted. Prices are getting higher and higher. Coffee was most disappointing, very weak. Still our place to go for special occasions. Food/service was wonderful. The food was excellent, the service was personable but a little slow in the beginning. There was a lot of noise from a large group nearby that made it hard to talk. Wished they had moved the group to their own area. Went for our anniversary. We had a wedge salad w/ blue cheese which was excellent and a house salad w/vinaigrette. We both had steak (strip and au poivre)and were very happy with the taste and the preparation. Au Gratin potatoes were excellent, hot and tasty along with the popular creamed corn. Finished with a cold chocolate cake. Not to memorable. Will go with something else next time.\nService is always top shelf. Prices are also top shelf. Plan on dropping over $100 per person plus parking. I guess that is why we don't return too often. Fantastic food and service. I really liked our waitress. To me the atmosphere is a little too stuffy but that is just my taste. Thank you for making our birthday celebration so nice! Excellent meal - just the right amount of attention by our knowledgeable waitress. Outstanding birthday promotion. 3rd time at the Chop House. 1st time was amazing. this last time was not impressed at all\n We get there at 8 on sat night. order drinks. then 15 mins later order dinner.. soup comes out immediately. 72 mins later our steaks come out it was 9:27 when we got our entrÃ©es.. i dont mind waiting 30-45 mins. but over a hour is ridiculous. especially at a restaurant of this caliber and price. \n\nI've been in the restaurant biz for over 25 years and if something like this ever happened dinner was discounted or comped completely.\n\nNeedless to say we will.never reture to this establishment. Thank goodness for an abundant selection in west Michigan. We went here to celebrate my birthday before going to the theater on a Saturday evening. The place seems to book up fast. The ambiance and service are both top notch. The electronic menu is wonderful and even includes pictures of most of the food items. \n\nPortion sizes are generous, the shareable side dishes are probably good for four to six depending on appetites. Its an upscale steakhouse, so expect to spend quite a bit. The food wasn't spectacular for the price, but its a nice way to treat yourself or a business guest.\n\nI would recommend and go there again. Great special occasion restaurant . Food exceptional!. Waiter Jon made the evening remember able. Spend the money. Good food and service is worth it. Exceeded expectations, as always. I introduced 6 others to your restaurant and they too, will come back again. This was my first time at this restaurant and now I can say 2 things. 1 - I can cross it off my list because I don't need to go back there. And, 2 - I'm just glad we were there on a birthday so we got 1/2 off our check. I've never had bland French Onion Soup before, but, this was. I've not experienced being unable to cut asparagus with a knife before, but, now I have. And, both of our entrees were served to us cold. Must just be that my expectations were too high. Simply amazing! Our new favorite restaurant in Grand Rapids. It is pricy, but the impeccable service and delightful food perfectly prepared and served was worth every penny. Our compliments to the chef and our server. Excellent quality food - we all had perfectly done filet mignon. The kale/spinach soufflÃ©, mashed potatoes, Caesar salad, and mushrooms were superb sides. The music was a bit loud at one point, but upon request they kindly turned it down for us. Above all, the service couldn't have been better. We went to a different restaurant for our Anniversary and were very disappointed. So we wanted a redo! We decided to do the Chop House. WE were not disappointed! The service was outstanding. Very friendly and personable. Our food was delicious and cooked to perfection. My filet cut like butter! Great selection of wine as well. Only thing that wasn't the best was going downstairs to the cigar bar for dessert. I don't think our server realized that they had rearranged the tables, and there wasn't a good spot for 2 people to sit. We were off to the side in living room type chairs and a small table....not easy to eat at and we kinda felt in the way. But again, the staff was very helpful and friendly and our desserts were fabulous. So it wasn't a big deal! Good for a special occasion or a romantic evening but can get pricey, great cigar lounge where your not overwhelmed by the smell as they have a fantastic fresh air system in place and a great selection of cigars and liquors plus deserts available while you relax in overstuffed furniture. The chop house has a nice environment. Quiet enough to have normal conversations. Food was excellent and the ambiance was very nice. We returned to the Chop House recently, having not visited for the past two or three years. We were most impressed by the friendly, professional service and attention to the smallest detail. The menus (on tablets) are fun, and display photos of each item, which is very helpful. Make sure you look at the photo and description, because some entrees come with sides, while others do not, and it may influence your decision to order the a la carte side dishes. The portions are large; it's a good idea to ask your server if something should be shared. All of our entrees (filet, veal chop, strip steak) were cooked perfectly as requested. I highly recommend the grilled romaine salad (good to split between two people). The wines by the glass are somewhat expensive, and the collection of white wines by the glass is a little limited. Dessert selection is outstanding. The only thing keeping me from going right back is that it is quite expensive. They have to pay for all those servers somehow! We always enjoy the atmosphere at the Chop House. As always the service is top notch. Our dinner was absolutely delicious. We will be back! Food and Wine was outstanding! Service was top notch! A wonderful evening! I always have a great experience here. Very busy the night we went out and the food took a while to come out of the kitchen but everything else, the food, wine, atmosphere, and service were amazing as always!!! The staff and the food was amazing; my only complaint would be that I didn't care for the Asparagus (which is probably me favorite vegetable), but my overall experience was great!\nAnd the birthday deal was a great way to get me to try it. The food was *so* bland. We went for my birthday and got 50% off the check. I got Beef Wellington and Creamed Kale/Spinach and he got a bone-in ribeye and baked potato. The Beef Wellington was so bland that I didn't finish it (how is it possible to make a bland beef Wellington?). The creamed spinach had more cream than contents - I had to go fishing around to find some spinach or kale. The ribeye was very plain. It had a good beef flavor, but there didn't seem to be any seasonings at all. The exception was the dessert. The Oreo creme brÃ»lÃ©e cheesecake was delicious and only $8 regular price. We won't be back for the food, even if 50% off. I can cook better at home for less than $80. As always , from the time I entered the Chop House until I left every thing about this establishment is a 10+ . Food was under cook. Harry the manager took care of it. The Chop House never disappoints. Great salads (large portions), great prime filets (cooked to perfection), and great service ('Jacob' was attentive, helpful, and happy to explain the options). It seemed that most diners were there for a special occasion. I really enjoyed the meal and it was my second visit. Very nice place for my birthday meal...Thank you. We went for my husband's birthday and brought our 5 year old. The food and wine were delicious. Our service was amazing. TJ was our server. I highly recommend him. The only downside was a family next to us dressed in jeans and sweatshirts with Dad on the phone all through their meal. For a $400 dinner I would expect a more refined clientele. The food, the service, and the ambience are always wonderful for celebrating a special event! Great menu. Great Food. Great Service. All the staff was awesome. I love the way that they all come together to place every ones entree on the table at the same time. I will definitely be back. Had not been there since my business entertainment days. Food was very good and the service only marred by delay in serving one appetizer. Doesn't any place have a dress code anymore? Baseball caps and tee shirts when you're spending $75-$100 per person. Really detracts from the dining experience. As always, great food, great service and great feel. The birthday offer makes it one of our favorite values too. Our top special occasion restaurant in west Michigan. Took a good friend who is from out of state, and we had a memorable meal. We chose the cowboy steak and the porterhouse. She also had the bisque and I had my steak done 'Oscar' style. She adored the bisque...and I enjoyed the Oscar. The service was excellent. Food and service was spectacular. Great atmosphere. A little pricey but is a great experience. Food was amazing. Service was great. We were seated immediately. My husband and I had a wonderful dinner at the Chophouse in Grand Rapids for my birthday. We were excited to come to the restaurant for this special occasion and it did not disappoint either of us. We had a wonderful caesar salad and Tenderloin on the bone with crab topping and demi glace sauce. We ordered the wild mushroom side which was delicious and perfect with the steak. Since we were eating late, my husband and I split the meal and it was enough. We topped off our meal with a dense chocolate cake - a small portion so it was perfect for dessert. \n\nI would recommend the Chophouse for a special occasion or a place to go for a romantic evening and dinner where you want to enjoy the experience and be able to talk without distractions. The restaurant was busy, but not loud. They did everything right and the service was impeccable!! The Chop House is one of the best restaurants in the Grand Rapids area. The service is excellent, very knowledgeable , and friendly . The menu offers a nice variety of entrees, desserts, sides are generous enough to share. Salad is generous portion and very fresh ingredients. We love to come here whenever we are in the area. Our meal was flat out delicious! The service was so professional, you felt like you had your own personal butler. Loved it, totally worth the price! Awesome service and great food, we have never had a bad meal here. Tried the onion soup this time. Very good. and the CrÃ¨me Brulee' cheesecake was delicious. The overall experience at the Chop House was great! Our service was very good. The food was delicious. We went with the lobster crab cakes, filet, roasted cauliflower and au gratin potatoes. The amount of food was enough for a meal of leftovers the next day as well. I cannot imagine ordering appetizers or salads beforehand with the amount of food in the entrees. We usually only go for their birthday special, which is awesome. It still makes for a fairly pricey meal, but affordable. It was a great treat! The dining experience was great. We made reservations and the table was ready on time. The waiter was terrific. The food was great...very tender New York Strip.\nWe would go again when traveling to Grand Rapids. We were seated by the aisle where every waiter, waitress, customer, bar and bathroom traveler went past. It was incredibly distracting and unnecessary as there were several other tables for two open. We made reservations to avoid exactly this.\nWith that said, the service and food were excellent. They work hard to serve, so the table setting was somewhat forgivable. It was expensive for a petit filet...44.00 for the steak is a bit too much for anything but a special occasion. The meal was cooked to perfection and the service fantastic. Can't wait for our next visit well worth every hard earned cent. Excellent service. Excellent menu and food. Great appetizers, salads, entrees.\nVery nice wines by the glass or bottle. Very comfortable. Service by Jameison was outstanding. The wedge salad was exceptional, but the Bone in Ribeye was under seasoned and did not have very good chew. If you aren't going to have salt and pepper on the table, the steak better be well seasoned. For the money which I do not mind spending, you'll get a better meal across the street. I order the 11 oz filet medium. it came back medium rare. sent it back and it came back well done. i mention it the server and he didnt even care. this has happen the past 3 times. i will not be back again. i eat at ruth chris weekly and i have never had to send my filet back. Went for my wifes birthday, told them about it in the reservation and when we got there, everyone wished her a happy birthday. Meal was VERY VERY good. Steak and filet cooked perfectly! Desert came out with 'Happy Birthday' in chocolate fudge! Catherine, our server was very attentive too! Plus they have birthday deal for 50% off for birthday person which made it a great value too! Food is all fantastic. My first time dining and won't be the last. We went to celebrate my husbands birthday. We were seated against the wall where you share a bench on the far left in the middle of two other parties. The table next to us waa obnoxious, loud and having inappropriate conversation the entire time we were there which really made our quiet dinner out annoying. We got our meal, I order steak frites med well and specifically 'not bloody'. It came and was far from med well and blood was all over the plate. A good waiter should have noticed this! We ordered two side dishes and got a plate of mushrooms (yuck!!) instead of mac and cheese. The waitress threw it on the table and left so soon I couldn't even tell her it wasn't right. They quickly made it right once we left them know. It was not the wonderful dining experience I have had previously with friends. Our service was excellent.\nTwo out of the three meals was excellent. The chicken was dry, but everything else was tasty. The dinner was very good however I gave it 4 stars only because the steak I ordered was not cooked enough. When ordered I told the waiter I would like just pink not bloody and she suggested a medium plus. When the steak was served, it was a medium minus or rare. Cool red center. They fixed the problem. My wife and I dined last night once again at Chop House, and it was a sensational meal, with terrific service. Our steaks were cooked perfectly and exactly how we ordered them, and appetizers and sides were all perfect. The wine list is a great one and we had a terrific Pauillac to compliment the dinner. The GM, Harry Johnson, went out of his way to ensure we experienced a wonderful evening. One of the best steakhouses we have eaten at anywhere in the world. We dine at Chop House every couple months, and it is always a sensational meal. Food and service were, as usual, impeccable and the wine list is top notch. Excellent service and cuisine. The only gripe I have is the rule of 50% off meal only on the day of your birthday. When the server tells you that you missed out it is even worse. Why not have a wider range of time since some birthdays are celebrated late. We came for dinner. They sat us next to the server station outside the kitchen. A classy restaurant such as this should not have any tables in such a bad spot.\nThe food was good. The Steak Au Poivre was tender and well-trimmed, but not enough sauce. The SautÃ©ed Spinach was delicious. Service was attentive with water quickly refilled. I will say that the way the servers put down the plates in front of us for each course was strange. They would look at each other, nod at each other, and place the plates down in synch, like they do on Downton Abbey.\nThe real disappointment and what prevented me from giving this restaurant a higher rating was their dessert and cigar lounge. Apparently, they use it for private functions as well so if there is a private party in there, smoking is not allowed. They said smoking can commence after 10pm, but then said that it can't commence until the private party leaves, which can be way after 10pm. They suggested we call ahead whenever we want to smoke cigars to see if there is a private function going on that night, but that is just too unpredictable for my liking. I rate the lounge as a fail and I do not recommend people come here for cigars. There was a full house during ArtPrize. Despite that, the waiter was very attentive. Nice salad, very good steak and tuna entrees, with amazing quality ingredients, although a bit too salty for our tastes. I ordered half portion of a salad, which was a good recommendation given the size, and it was great. I also ordered a half portion of asparagus as a side dish, which was grilled o perfection, but did get a whole portion somehow. The dessert sorbets were so-so; not very flavorful. Was in town for ArtPrize with my 11 year old daughter. We both love steak and I wanted to go out for a special meal that was a sure thing. The Chophouse did not disappoint. I sometimes find restaurants dismissive of women dining alone and was very impressed with the level of service we received. Our server was very patient and helpful with my inability to choose a glass of wine and the filets were cooked perfectly. Atmosphere lovely. Thank you for a memorable evening! We did not have a good evening because despite our having made this reservation over a month in advance, we were to be seated at the overly-large table between the bar and the window. We were a group of six and this table seats 10 - 12 people in addition to which it is a very wide table which is awkward for people with hearing difficulties. We requested a different table but were told we could not be accommodated. We were so unhappy that we ended up moving across the street to Ruth's Chris. It's always a pleasure to dine at The Chop House. Great steaks, over-the-top salads, and service beyond compare (ask to be seated in 'John's' section!). Fabulous menu choices. Very accommodating for splitting salads accompanists . Jacob our waiter made our dining experience memorable. Chop House was wonderful from greeting to the carrot cake desert (Thanks, Caleb!). The food is so delicious and the servers are amazing. We celebrated our anniversary, requested a booth and we couldn't have asked for more. A great evening. We enjoy having special occasion dinners at The Chop House. I'll also occasionally have dinner there with business colleagues. \nThe steaks and side dishes are all very good. I have also found the seafood to be quite good but I would not consider The Chop House as a destination restaurant for seafoods. \nThe service is good but too fast. They should allow more time between appetizers/salads and the entree. We felt rushed. \nThe wine list is underwhelming and over priced. We may have a glass of wine but will usually just have cocktails which are quite good. \nWe will return. By the way, The Chop House beats Ruth Christ's on all levels--no contest! We like this restaurant. The steaks were excellent. We would go more often but it is a bit too pricy. The chophouse was great. Very pricey but great food and impeccable service. \n\nVery good service from Brittany! The food was delicious & great wine list! Had two errors with orders (brought wrong salad and then wrong entree); then had to wait for correction, but encouraged other guests to start their meal so their food didn't get cold. Created an awkward situation. Of all the expectations we had, we assumed (because of the caliber of the establishment) that the orders would have been perfect. Plus, there were only four of us dining. \n\nThe meats were all excellently prepared and seasoned; very flavorful. My wife and went here for the first time for our 10 year anniversary. Our steaks were amazing and cooked perfect to our request. Our waiter was on point and very knowledgeable. Our glasses were never dry (water,wine or whiskey). Great staff, great food. Went to celebrate our 15 year anniversary. The waiter, Michael, was amazing. We asked his suggestions and he was on point! We loved how the pastry chef specialized dessert for us! Walk in the door and you enter a world of superb ambiance , professional staff and the food was excellent . It's a totally great dining experience . The service was outstanding and the food was superb. !!!! Every aspect of dining at the Chop House in Grand Rapids is a superb and gratifying experience. Food and service was outstanding!!!! What a great dining experience! \nEverything was outstanding . From the time I entered the Chop House until I left, it was phenomenal ! The food was outstanding !!!! An excellent dining experience from the time walking in the door to the time walking out. Outstanding in every way! The only place I want to dine in Grand Rapids. The Chop House always works to main the highest of quality in their service and food. When going to other restaurants I always judge them using the Chop House in Grand Rapids as the bar that they must meet. A few come close . On a scale of 5 points I would give the Chop House in Grand Rapids 10 points! \nWhat an outstanding place in every aspect!!!! The food was excellent. the servings are very large and can be easily shared. the noise level was high as there were three large groups eating at the same time. We will certainly return. If you want class this is the place. From the minute we arrived it was a true experience. You can tell every staff member is well trained. Moving on to the food. It is a bit pricey but outstanding. While our waiter was 21.5 years old he made our dinning worth the price. He is an outstanding asset to this establishment. Excellent service & wonderful meal! We love The Chop House!!! The service was excellent! The prices were a bit hard to swallow, although the food was not. It was also exceptional. It mostly goes to the prices. Kinda hard to accept and defend. This was probably my worst experience at the chop house; normally have a wonderful time. This time our service was intermittent at best (over an hour to get our food, empty drink glasses for 10+ minutes at a time) and when the food finally did come out, it was over cooked. I want to really emphasize that this is the first time I've had such issues, but it does happen. Service is above and beyond here and the food is spectactular. We went to Chop House for my husband's birthday and we had a wonderful experience! The 50% deal is truly that--50% off your total food bill for 2 people (drinks excluded). We were so pleased with our salads, steaks, sides, and dessert! Our drinks were equally enjoyable! The service here is fantastic and we could not have been more pleased. The wait staff here is top notch. We will definitely be making many return visits. Thank you for such a great evening. Food was fabulous as always, but the 15 minute wait (we had a reservation) and the used wine glass on my table brought the night down. I feel like when you're dropping that kind of money on a meal, there's a basic expectation to not have to deal with dirty items and a lengthy wait. Steaks were amazing. Cocktails expertly done. Service (John W.) was perfect. Not the best that I've had at the GR Chop House but I also figure everyone has at least one bad day. My steak was way under cooked and surprisingly tough. I will return as every other time I have been there it has been outstanding. Service was and always is fantastic. I just find the food a little less than diserable. The wine pour selection by glass if not good, if you can't get everyone to agree on a bottle. The martinis are very well made so that makes up for a it a little! Steaks were amazing but with that said it wouldn't break them to through in a side or two when the steaks are at least 45 a plate. Some meals came with sides some didn't. It was very confusing and people at the table sharing sides and deciding what to get not fun. I promised my business partners/customers an outstanding dinner evening and with no exceptions they all agreed it was!\nAll food was exceptional, the lobster bisque to die for. Great wine and perfect service.\nWill definitely select this restaurant again for future business dinners. Went to the Chop House last night (8/26/16) with my wife for dinner. We enjoyed the food our during our last visit, however this time it was simply terrible. My wife ordered the spicy shrimp app, the shrimp were dry and over cooked. Our entrees arrived shortly after we finish the app. I ordered the bone in filet special and my wife the scallops. We also had mashed potatoes, Mac n cheese, and asparagus. All of our food was devoid of favor. The scallops were mushy as well as the bacon in the smashed potatoes my wife received. The steak had the blandest cheese on top that did not complement the steak. The sauce for the steak was unbalanced and only tasted bitter. All of our food was in desperate need of salt. The smashed potatoes bland no butter no creaminess just unpleasant to eat. The macaroni noodles and the sauce had not taste. If the asparagus didn't have parmesan cheese on top they would been an under cooked messed but at least the cheese gave a tiny bit of flavor. \n\nThe only positives were good service and an excellent dessert, creme brÃ»lÃ©e cheesecake. A definite waste of $250 last night. We would have been better off getting fast food somewhere. Overall the worst meal we've every head at a fine dinning establishment. Wonderful place have dinner for occasion. We eat there at least twice a year. Raw oyster were fantastic, potatoes cheddar au gratin excellent, and the steaks were done to our liking!! The service was amazing from the moment we walked in the door. The food was delicious from appetizer to dessert. Ambience and service were exceptional as should be expected at a restaurant like this. The food however was disappointing. I ordered the porter house medium rare and it was fairly bland to be blunt. Ordered mashed potatoes and asparagus as sides and both were very disappointing. For the price paid, it just wasn't what I expected it to be. Went to dinner after a long work conference. Excellent food and the service was outstanding. Celebrating our anniversary. We had a very enjoyable evening. Our server was very attentive, and had a thorough understanding of the tablet menus. His suggestion of a wine pairing was perfect as well. We didn't feel rushed at all, and took about two hours to enjoy our meal and conversation. \n\nNote: Their steak preparation follows an 'enthusiast' doneness level (my term,) so most will want to request one additional level of cooking time. We've gone to Chop House the last few years for my husbands birthday. It is always superb! In the heart of downtown and close to several hotels. good food and great service. The food at the chop house was great! Our server was amazing! We have always had a great experience at The Chop House- food was excellent-price was probably best for a special occasion. We had the best waiter ever- Jamison-knew his stuff, had some humor, just did a great job. I have been to many steak houses and this is one of the better ones I have been to. Great selection and the menu is a la carte as many higher end steakhouses are. Steak was cooked perfectly with fantastic flavor and texture. The 2 sides we split were the creamed corn and mac n cheese and both were great. Nice crunch of the breaded topping on the mac and some of the better creamed corn I have had (I'm admittedly not a creamed corn fan). Service was very good and items were brought out nicely timed. Overall a great dining experience and I look forward to coming back. Pricey but excellent. Service and food were great. A great place for a special occasion! Bring your wallet. My filet was superb; one of the best ever. Grilled romaine tasty.\nWe were seated in a booth this time; will request this next visit.\nOur server,Jessica, was charming and attentive! Came here for a night out with my wife. This was our first trip to the Chop House and it was more than could have been expected. Exceptional food and service. We had used the online reservation, and were seated immediately upon arrival. All of the staff was very knowledgeable and friendly. I recommend the 11oz filet Oscar style! One of the best meals that I (we) have had! Great menu and very well made cocktails. Service was attentive but not over done. We were there to celebrate my mother's birthday. The restaurant came as a recommendation from a friend of hers. Just overall very well done!! Was a wonderful evening. Courses were well-timed and food and service were perfect! Tried cigar lounge and it was a great experience as well. Dinner was extraordinary, Service was phenomenal. I would highly recommend. Good food, good service, nice ambiance, but really very expensive. The Chop House always manages to go above and beyond a normal restaurant experience. The greeters are friendly, the wait staff are very well trained and knowledgeable, and the food is magnificent! We celebrated my husband's birthday (you can't beat The Chop House's birthday discount) recently with a bottle of wine that was recommended by our server, Amber, and completely met our very peculiar wine expectations. Our meal was served in a timely manner and prepared to our satisfaction. We will definitely be back! I chopped 1 star off The Chop House and I will tell you why. First the positives; beautiful decor, incredible service and truly very good food. Why remove a star, you ask?\n\nThere was nothing special about the Caesar salad but that isn't the reason. The menu states that the Cowboy Ribeye is 22oz to 24oz. The steak was beautiful when it came to the table, cooked perfectly and and seasoned quite nicely. However, there was a huge amount of fat on the steak. So including bone and fat, I might have had about 10oz of beef.\n\nI eat at a lot of great steak places and I would go back to The Chop House. I would probably not order the Ribeye but would opt for the NY strip instead because at least I would not encounter an unknown quantity of fat. I visit the Chop House about twice a month and find the service to outstanding. Also, I love the cigar bar, however, it should be dedicated even if you have to reduce its size so people can count on it being available or not. The dÃ©cor seems dated and dark...could use an overhaul. I keep coming because of the service, food, and cigar lounge. We went for my husband birthday. The staff was very friendly and responsive. Most of the food was good, not great. I ordered a large filet. The cut was one near the end so was irregular. It came out a little overdone, but not enough to warrant returning to the kitchen. The servers were spot on and did an excellent job. Rather pricey, but a local favorite. Chop House has been in Downtown for some time and it has an authentic flavor that hearkens back to the 40's fine dining ambiance. I expected some mobsters to be seated at the next table! It's dark, hard to hear, but delicious and fun. Second time dining here in 6wks. Food was wonderful. Brought family. They loved it also. Great Food and Deserts. Downstairs is really cool! Excellent service with delicious upscale cuisine. Perfect for a special occasion. Excellent service, delicious food, pleasant ambiance. Very expensive. I had the small filet and asked for it done rare. It was cooked to perfection. I had read a review on Yelp that the steaks were tough. However, I suspect that reviewer had insisted that his steak be well done, which is enough to ruin even the finest steak. I had my steak without any accompaniment; a good steak will stand on its own without any garnishments. My filet certainly did. It was outstanding. Very disappointed. $52.00 Cowboy Steak was tough and flavorless. Wife's fillet was mealy and tasteless. The staff and manager were apologetic and tried to make things right which was appreciated. The replacement steak was not much better however. The Chop House is amazing. It is a gem in the downtown of Grand Rapids. There are not many high end restaurant with this quality of food and atmosphere. Thanks for a great evening celebrating a special occasion. Excellent place to have dinner. Staff was excellent and food was out of this world. Will be dining there again. Had an amazing meal! The food was great, the service was fantastic and the manager came over to greet us and was super nice. Thanks for making the meal as special as we were hoping! Hostesses were welcoming and accommodating. Bartender was knowledgeable and attentive. Our server John W was wonderful - patient and efficient and had great recommendations for wine pairing with our meals. Chop House continues to be one of my favorite places in Michigan. I appreciate the consistency--their attention to detail and excellent table service are what really set this restaurant above others. Great work as usual. I took my two teenage girls here for first time. This is a favorite restaurant of mine and I wanted them to experience it. They loved it. Now they know what a proper steak tastes like and what proper service feels like. You guys are great. Keep it up. The food was outstanding including the service. I would say it far exceeds its competition across the street. Very nice way to celebrate an anniversary. Been a long time since I have had that nice a dining experience, a special treat for us. From the ever professional and attentive staff, to the special service details, and the excellent food, The Chop House is the High End Dining dinning experience you always hope for. You may hear yourself saying Wow out loud, as I did when this perfect porterhouse steak was ceremonially presented. \n\nThe Chop House is an excellent place to go for a special occasion. But it would also be a go for a business lunch as well. This level of experience, comes with a comparable price. But fair for this class of experience. As always, our meal was exceptional, the service was flawless, and the atmosphere made our birthday celebration feel like a true celebration. We had four different cuts of steaks on our table and all of them were perfectly seasoned and cooked to the requested temperature. The seafood platter appetizer is a must have as a starter. And they have the best selection of steakhouse sides of any steakhouse I have been too , including a creamed corn and macaroni and cheese side that are good enough to go back to just have those for dinner. I was disappointed with the food. I got the salmon, and my husband got the swordfish; both of which were ok, but definitely not worth the price. We also got the side of mashed potatoes which was awful-tasted like fish. We did enjoy the french onion soup though, which we got to share prior to our meal. TJ was a great server! My husband and I decided to try out Chop House for our first wedding anniversary last year and we fell in love. The food, the staff, the ambiance were all 5 star worthy. So much so that we decided before we even left that this would be our anniversary tradition. So this past weekend we followed through for our second anniversary and again we were thrilled with our evening. Quite a few staff members including two different managers came to our table to wish us a happy anniversary. This is something we now look forward to every year. Thank you Chop House for such a wonderful experience. First time at this restaurant and it has become my number one place for dining.\n\nGreat menu but we had two specials of the day; for appetizer (spicy shrimps) and entrÃ©e (filet mignon). Both were winners of first prize at a food competition. \n\nDefinitely returning there next time in town. Excellent food and excellent service from crystal. We can't wait to come back again. The food was excellent. I had a steak, medium rare, which was cooked to perfection. The meat was very tender. The service was very good. We never felt rushed, nor were we seating idle for very long. The prices are a little high, but worth every penny. Parking is not a problem because there is valet parking, $10, right across the street. We had no problem talking because the noise level is very low. \n\nI try to go to the Chop House a couple times every year. Grand Rapids has a vibrant restaurant scene and it is difficult to take advantage of all of the opportunities available. We have threatened to go to the Chop House for a few years now, but for one reason or another we have never gotten there for dinner. It was worth the wait! Excellent food, service and ambiance! Don't wait to visit this jewel! Great time was had due to a great dining environment! The Chop House is one of our families favorites restaurants' to dine at, especially for special occasions. It was my mother's birthday, and she asked to go there. They treat everyone with such respect, and the food is always amazing! This was our 3rd time here and we've never been dissappointed in any way. The scallops are our all time favorite dish! The staffs are very kind and outstanding! They all deserve a raise! ;) We celebrated our 6 year anniversary and each of our birthdays here and they make us feel sooo special! I love it! The food was great and the portions were very large. All the sides were definitely large enough to share. The atmosphere was very nice and the staff was good, not always at your table, but there when you needed them. For my budget, this would be special occasion dining only. We hadn't been here for quite a few years, since it is a splurge. But it was a splurge we enjoyed. Perfect martinis, very good fresh raw oysters. The caesar salad was the best preparation I've had of this dish in years. The steaks (wet-aged, not dry aged) were very good, large, and the side dishes (vegetables or potatoes for a separate charge) were tasty and the ortions large enough to share. The tuna was wonderful in its quality, preparation and taste. The wine list is limited but adequate by the glass; there were many more choices by the bottle. Our server never had us waiting for anything but was not overbearing. The service was outstanding, the food was remarkable, & the atmosphere was exciting. Basic upscale steakhouse. The menu wasn't terribly imaginative. I would suggest this place for business travelers who were looking to expense a good steak dinner with clients who didn't have adventurous tastes. Pricey but no surprises and service was adequate. If I am to be totally honest, I was really disappointed with The Chop House overall. I was looking forward to a high end dinner with my husband, as we do not get a chance to do that very often, and It started off great! The service was wonderful, the menu was impressive, and the prices were about what we expected. However, when our food came, we were seriously disappointed. He ordered the venison, and it was good, but by NO means was it worth what we paid for it. I ordered the swordfish, and it was very dry and very bland for being blackened. We ordered the garlic spinach as a side, and it was so salty, we couldn't even eat it. The best part of the whole meal was the Creme brÃ»lÃ©e and the coffee. Sad, because We spent over $150 for a meal we could have had elsewhere for about half that price and it would have been just as good or better. We went here for a birthday dinner. You can't beat the birthday deal. The service is awesome and the food was delicious. The Chop House is so convenient for a quick dinner prior to any evening function at DeVos Hall. The evening we dined was just another example of great cuisine and polite service. Catherine was our server and acknowledged us by name as we were seated. We started off splitting the house salad (I don't know how anyone can eat the entire salad by themselves!) topped with chunks of blue cheese and dressing. My wife's scallops were perfect. She ordered only four instead of the five that show on the menu due to their large size. Delicious. My prime filet which was grilled to perfection. Portions are huge. The manager made the rounds doing food checks and welcomed us back. Looking forward to returning! A quick dinner with friends before a 7:30 show at DeVos. 5:30 rez. I split the house salad (they're huge!) with my wife. I enjoyed the Blue Cheese dressing with big chunks of blue cheese...my favorite. The lamp 'lolipops', listed as an appetizer on the menu, were big enough for my main course and they were grilled to perfection. An excellent evening, for sure. Kudos to our server, Hannah! Service was remarkable. Food was excellent. Seemed like a 'happening' place. Great birthday celebration with top-notch food & service. This is a good restaurant, there is no questioning that. However, when you have a $200 bill with only 2 beers, you would expect it to be a new benchmark in fine dining. Everything was great, just not the next level I was expecting. Awesome dinner. Highly recommend the Cowboy or the Beef Wellington. Jacob and Blake were both extraordinarily friendly and accommodating. Chop House has it all! Superbly prepared food, lovely ambiance, wait staff that delivers your selections like a well-rehearsed ballet! The Chop house is a great place for celebrating special occasions, enjoying an evening with your colleagues from work, or treating your special someone to a wonderful dinner. Prices are on the higher end, but the service and the quality of food make it of good value. My girlfriend and I were celebrating our anniversary and neither of us had been to the Chop House before, needless to say we were pleased with our visit. Our server knew the menu forwards and backwards and didn't seem to be in a rush to check her other tables and focused on us .The only knock I have on the place, and it might just be my personal preference, was the lighting--it was a bit on the dark side, but to each their own. Overall a great experience--one in which I would recommend to anyone. Appetizer Lollipop lamb chops were anorexic. Had better at a blues house. I couldn't stomach the house salad dressing. The Medium Well Porterhouse Steak came out Medium. It needed Steak Sauce. Tasted like something from Texas Roadhouse instead of a fine resturant. The mashed potatoes left a instant potatoes taste in my mouth. I had to chase down a server, not even ours, to get the check. Never again. I should have went to Ruth Chris. I went there for Mother's Day and I should have went back. The taste and presentation of the dinner here was excellent. Items were fresh, cooked with attention to detail and served in a manner worthy of note. While rated $$$$ the quantity was in keeping with the price point. A wonderful gem nestled in downtown GR. Well worth one's venture and time. We have dined here before and really enjoyed it. We decided it would be a great place to celebrate our daughters graduation. We could not have chosen a better spot. The food was outstanding and the service impeccable. If you are in the mood for steak in Grand Rapids, this is the place you want to go. Great server, he was very helpful in finding me a vegetarian meal off menu. The wine was exquisite and the tablet menus were pretty cool. However, my boyfriend order his stead medium and rare and when he cut into it, it was 100% rare. He ate it because he new it was great quality, but said he wouldn't want it that rare again. Regardless, the overall experience was awesome & my custom ordered veggie mac n' cheese bake was amazing. Great food & great service! Treated like huge inconvenience. Terrible service and main waiter was not friendly at all.\n\nFood was just okay. The value was not there as the meal was extremely expensive and food was just ok with terrible service.\n\nI would never recommend this to friend let alone a stranger. We loved using the online booking. When we got to the location we had to wait longer for our seats before sitting down BUT the manager took care of our drink that we ordered and then got us our seats. A nice meal, a pleasant ambiance and fancy but ok service. Considering the price, it's nothing to write home about. The French onion soup was very good, the fillet steak was good, the ala cart broccoli and mashed potatoes were ordinary, the Rosemary chicken lacked flavor, the bread basket was marginal and the carmalized sugar on the cream brÃ»lÃ©e tasted a bit burnt.\nIf it weren't for the birthday discount I'm not sure we'd consider it for any other special occasion. This was by far my best experience I have had at a restaurant. The food was INCREDIBLE and the service was spot on. I loved the presentation of all the dishes. I seriously would recommend this place to ANYONE looking for a really nice upscale romantic restaurant. We had everything from their beer, to wine, and appetizers with soup and salad to our main dinner and dessert. Every single bite of food was amazing. I could write all day on how much I loved this place. Seriously... Husband and I went here for our wedding anniversary and they even wrote out 'Happy Anniversary' on our desert plate. And I have to add, my husband is not one that will compliment a place on food and service, and he talked about this place for a couple of days!! It is a bit pricey so it will be a while before we get the chance to go back, but it's worth every penny! went early evening and service was outstanding. even hostesses were right on the money, the liquor was priced correctly, appetizers above average cost, but average. entrees and addons better than average but cost far exceeded average. biggest complaint, four people dine, cost over $425.00, and when i'm done i still had to pay for parking. validate and make your customers feel better about what they just spent for dinner. We had special friends in from Santa Fe, NM; and wanted to introduce them to one of the best restaurants that we have in Grand Rapids, MI. Our evening stated off on the wrong foot when our wives went in ahead of us as we parked the car, and were seated at a very small table for four against a very large concrete post besides the kitchen. Clearly this is the the worst table in the restaurant. After realizing that other tables and booths appeared to be available, I asked if we could be reseated. InitiallyI was refused due to them being reserved; however after a few minutes while we were being served our drinks they advised that we could be moved to a great booth that was now automatically not reserved. We were pleased. We had made reservations for the evening and expected better treatment. Once seated we were served our wine, and during the delivery of bread, the waiter knocked off the bottle of wine and its marble cooler totally off the table hitting our guest's foot and spilling wine everywhere. An apology was granted and ultimately we were given credit for a half of a bottle of wine. This was like an insult and any first class restaurant would normally have credited the whole bottle of wine and been a whole lot more concerned if anyone had been injured. The rest of our meal went well, albeit the occasions a bit tainted. This was a horrible introduction for of our world traveled guests to the Grand Rapids Chop House. This is very disappointing and embarrassing as we have frequented the restaurant several times in the past. Great corn. Steak had good flavor. Cocktail was really strong. I would come back. It's a bit pricey should be a little bit cheaper especially for what you get. The food and service we're excellent! We celebrated my daughter's graduation from GVSU. The desert she ordered had happy graduation in chocolate on the dish. The prices are high but the value was higher. My husband and I celebrated our second wedding anniversary at the Chop House on 4/25/16. From the moment we sat down to the moment we left we enjoyed every minute. Kim our waitress was beyond wonderful!! She had a great sense of humor and very attentive. For our dessert she even had the plate personalized, unbeknownst to us. The food was divine and so was the entire staff. We just may be making the Chop House our go to for many anniversary's to come. The steak was excellent yet the was undercooked and for dessert the creme brulee had too much egg and was not the correct flavor or consistency. Restaurant is nice I stef but with some definite bad table locations, so be careful to request booth. Service was very good but almost too robotic and unnatural. Staff should smile once in a while. Finally for a steak restaurant they do not know how to cook a filet. Everyone ordered a different temp from medium rare to medium well and EVERY steak came out very rare! Staff acted surprised! Huh? My medium was so rare that it was cold and blue in the center. Like cutting raw meat. Add to all this a $100++ pp, and I just don't understand the popularity. We went to The Chop House for my birthday and the food was outstanding. The service was impeccable, which is something I really appreciate as a former fine dining server. Pricey but worth it. We will be back! The customer service was excellent and the side dishes were superb. My wife and I had dinner at the Chop House and were looking forward to it as the reviews online had it rated high. The atmosphere is very nice, dimly lit, great ambience. The service was excellent as well. Attentive to our needs and extremely professional. That's where the positive review ends however. The food was sub par for what was a $250.00 dinner for two. Our oysters on the half shell tasted extremely fishy and had sand in them as well. Not a great way to start. My biggest reason for going was the meat so I ordered the Cowboy Steak ($50.00 something) as it is the fattiest and one of the tastiest bone-ins they have. When I ate it however the flavor was bland. I should preface that I LOVE steak and have eaten at many high end restaurants that showcase that as one of their features. I found Ruth Chris next door to have a better steak than Chop House. If the restaurant were less money I would probably go back to give it a second try. Unfortunately it is not so I will not be coming back. We have dined here multiple times and I'm always impressed with the preparation of the Filet Mignon. From start to finish, the experience was as expected. My only complaint is the the special 'presentation' of the food (all dishes lowered/served at the same time). Drinks were topped off routinely. I've definitely had better for less $$, but it was a special occasion and the requested destination. Went to chophouse for our 9 year anniversary. The service was amazing and the staff made our night special. Will be back to enjoy the atmosphere again. Chop House was amazing! Everything from the service (Kim was the BEST), the wine list, and most importantly, the food was beyond expectations. The filet was perfection, the lobster bisque was to die for and the crab cakes were the best I've ever had. Will definitely return next time I'm in GR. Thanks again for a memorable experience. The menu is fantastic. The service was fantastic. It was a great experience. Let me start out by saying that the service was excellent! Our waiter, Matthew, i believe, was great! I've just never been wowed by the food. There are a lot of people in town who love Chop House, so you should take my review with a grain of salt. I also don't eat steak anymore, and didn't personally order it at this dinner. I had the crab cakes for my meal and thought they were average. The sides and veggies were all very good and fresh. Wine list is really nice....options at many price levels. We didn't go downstairs for this dinner, but the cigar lounge is a nice change of pace and something a little different if you're looking for something unique to do in GR. I took my husband there for his birthday. At first steak was too rare for my taste sent it ack came back a little dry BUT manager came out ordered another one and fixed our bill. It was a wonderful experience. Appetizer drinks food n dessert was amazing and so was waiting staff. Customer for life here!!! I moved here 4 years ago and have came here for my wife's and mine birthday as well as slipping in a few other times per year!! I LOVE THE FOOD, SERVICE and EVERYTHING !! My husband and I love to go here at least once a year for a very special night out. The food is first class as well as the service. I love this resturant!! My fiancÃ© and I went here to celebrate his birthday and it was so romantic and special! I would recommend this resturant to anyone!!! They have an excellent menu and the staff to match! We absolutely love dining at the Chop House. Perfect spot for a romantic dinner or special occasion. Quite simply the best meal we have ever had. To start, we had the crab and lobster cakes (2 generous cakes) and the scallops (3 nice size) and the Lobster bisque that we shared. We had the Beef Wellington (we also shared) and our sides were the asparagus and scalped potatoes. Rounding off our meal, we got the CrÃ¨me brÃ»lÃ©e for dessert (which they wrote Happy Anniversary in the most divine caramel sauce ever! )\n\nWe also had a $42.00 bottle of wine. Total bill was 180.00 ish :o\n\nEVERYTHING was fantastic! The only thing we didn't car for were our sides... they both seemed under done.\n\nThe service was amazing! We had reservations for 6:30pm and we were running a little bit late, I was able to call the hostess from the Open Table app to let them know when they could expect us. Upon arrival we were seated at the best table. Our server Olivia very helpful, and did an excellent job recommending cocktails and desserts. Overall a great job was done by everyone. This was our first time dining at the Chop House. My steak (filet) was melt in your mouth goodness. The blackened swordfish steak was so tender and had a delicious taste. We couldn't leave without a piece of the Creme Brule Cheese Cake which was heavenly. The service was excellent, and our waiter was very attentive. It was an amazing date night for my husband and I. Happened to be in Grand Rapids for a weekend. Ate here with my wife and the service and food was perfect. They didn't miss a thing. \n\nTypically dining like this I would expect in places like Austin , NYC or Chicago. Quite surprised to find a great restaurant like this in Grand Rapids Mich. \n\nI have eaten at their location in A2 as well, they do a good job at this restaurant, I would eat here again. One of my favorite restaurants in Grand Rapids. You really pay for it, but the food and service are outstanding. I brought a friend that has never been to the Cop House on this visit and he was very impressed -- continuing to talk about his Porterhouse a week later! The filet was great. Order a step more done than you usually would. Our table was too large for 4 people, making conversation difficult. It is great how everyone's meals get delivered simultaneously. A bit pricey, but good for a special occasion. I made reservations for my husband's birthday about 6 weeks in advance and when we arrived, we were put at a table right next to the walkway to the bathroom and then kitchen. People were CONSTANTLY rushing by and servers were abruptly dropping plates on the table behind my chair (setup table?). This really killed the mood. We wanted to move seats, but by the time the waitstaff got to our table, there weren't any options.\n\nOverall steaks were cooked well, sides were great - but there was something off in the Sidecar cocktail. This is our favorite beverage in Detroit bars, and the ratio was completely off. \n\nIf we had a better table, we would have enjoyed our experience much more. We were happy to see a nice restaurant in GR that offered great food and a fine dining experience - something we missed from the Metro Detroit scene. I used to be a Ruths Chris guy, always went there for birthdays and anniversary. This completely changed my mind, Chop house won every category. They have a better steak, sides, and desert. Just a great experience all around. Had a wonderful time dining at The Chop G.R. HAving a job within mainstreet ventures i had expectations of my own and from the food to the server(Crystal, i beleive was her name) to anyone who came to the table i was greatly impressed. the lobster bisque was phenominal and the baked alaska was the best thing i ever tasted. Although the venison and lamb chops could have been cooked a little more the entrees were very satisfying. The food is very pricy and what you get in return is nothing outstanding. I will only come back for birthdays as the food bill is cut in half. I planned a fun night in GR with the boyfriend. Everything about the Chop House was excellent. Make sure you know the prices before you go. Nothing wrong with that. It was first class service, first class food. I like that our waiter didn't just come to the table interrupting our conversation. Just served quietly. \nI didn't like sitting right next to the serving station, so we switched our chairs around at the same table. Much better to look at other guests than the serving area. You won't find a better all around restaurant in the state of Michigan. I travel quite a bit for my job within the U.S. and am constantly eating at nice restaurants. None have exceeded the Chop House in Grand Rapids. Expensive but always worth it. Thank you. Great food! The best steak I ever ate. A little pricey but worth it for a special occasion. A little disappointed with our table which was right next to the staff computer station. Next time I would ask for a quieter table. I loved the food, the servers and the atmosphere was perfect for my husband and my 41st/40th birthdays! We will be back soon! Not to mention we received half off our bill for our special day! Wasn't our best experience here. The steak didn't have as much flavor as usual and there was egg shell in the dessert (they comped it and apologized profusely, not a huge deal, handled well, still worth noting). Glad they got rid of the iPad menus. Service was outstanding. Food was good but not befitting of price point. Lobster Bisque and Grilled Romaine salad met expectations but steaks were just average ; they were cooked to temp perfectly but didn't have much flavor-we have had better across the street at Ruth's Chris for comparable cost. \n\nAlso at a table directly next the the stream of servers coming in and out of the kitchen. While the service staff did their best to be discreet it was still a major distraction to have the constant foot traffic walking back and forth. Took my wife here for her birthday. The food was excellent, a bit pricy but not Moe than I expected. Staff was very polite and freindly. I would recommend to anyone looking for a upscale pleasant experience and excellent food. The food was well worth the price. It was what I was hoping for when I made plans to go. The discount for a birthday also makes it manageable if you can't afford as high of prices. This is one of the better upscale places to eat in Grand Rapids. The high price you pay is for the experience and the service more so than for the food itself. The food is of superior quality to most other steakhouses in the area, but I would not consider it phenomenal. Really enjoyed the food but found it overpriced. We chose the chophouse for the birthday discount without first seeing the prices. Had I known, I would have made another choice.\n\nTried to joke and interact with the servers, but found them stiff and uninspired. The food and service are great, the price is absurd, 2 steaks, 1 appetizer, 1 desert and 4 beers\n $300 including tip.\nThis is clearly a restaurant that caters to supplier, lobbyist and people who have more money than they know what to do with dinners. \nThere were also sugar daddies, cougars and the arts types people eating here, we sat next to a guy that looked like Pee wee Herman, the people watching almost made it worth the $300, almost. Food is excellent but overpriced even considering the quality. I had a smelly bar glass, the waiter tripped on my foot, the calamari was not impressive. However the bone in ribeye was delicious and cooked exactly how I requested it, which was between rare and medium-rare. Easily the fanciest, best- tasting, and most excellent ambiance restaurant I have ever had the pleasure to dine in. Service was fantastic, setting was wonderful, and food was devine. I'm a broke college student but wanted to take my boyfriend here for his birthday, and I have to say that despite being very high priced, it was well worth the money and we would both come again. It was a wonderful experience that I would reccomend to anyone for a special occassion or a high-class night out. In addition, the birthday deal they offer is impossible to pass up! Waiter made note of the birthday, chef personalized our dessert, and the 50% off the entire bill was great. Big thanks to the Chop House for making this a special experience for us. Can't give this a high enough review.\n\nFood review:\n We got a Ceasar Salad, Lobster Bisque Soup, Baked MacnCheese, Swordfish steak, NY Strip Streak, and a Creme Brulee Cheesecake. Had a hard time deciding what was our favorite; they were all amazing. Excellent excellent food. Portions are generous as well- we split and shared everything and still had to box some up for home. The meal was very over priced. I have had better steaks at Carrabbas and at a significantly lower cost. A fancy presentation does not make a meal taste any better, nor am I impressed by pomp. My wife & I went to the Chop House to celebrate her birthday based on the recommendation of a friend. If it's your birthday, you get half off your food bill. We both had the 'Kobe Style' Rib eye (American waygu) that was their special at $79. It was a 16oz cut and very good! We both like our steaks medium rare and were told to order it medium. That was good advice! The sides were good too. The wait staff were very good and we enjoyed our experience there. We'll be back again! Very nice restaurant, great customer service. Very nice atmosphere, romantic, friendly wait staff. Food is very good. Love when they run specials. Overall, my biggest issue has been with the front of the house. The last two times I made reservations through Open Table, my party has been shuffled off to the side and told to enjoy a cocktail. As with most people I enjoy a good cocktail, however, in each instance we had to wait 35-40 minutes to be seated. This past Saturday was not overwhelming busy or I would have understood the wait. If I had not been proactive and complained, my wife would have had to wait longer for her birthday meal. What was equally annoying was to witness groups of 4 who had later reservations being seated before my group of 3. In the end it all worked out and the Manager resolved the issue only because I brought it to his attention. The Chop House is not what it use to be. Went there with reservations on a Friday evening. We were seated in perhaps the worst location of the restaurant. Right above the stairs that lead to the cigar bar downstairs-a definite 'high traffic' area all evening long. Ordered an expensive bottle of wine (which was wonderful)-disappointed in our server that other than the 'first' pour, she never returned to our table to check on it or to top off our glasses. Our steaks (Filet) were ordered medium and arrived medium rare (total red center). We ate around the outside and took the rest home to finish on the grill. The Lobster Bisque was fantastic. All in all food was good-just not the memorable evening that dining at the Chop House always was before. We had filet and beef wellington, along with the amazing au gratin potatoes, and lobster and crab cakes. It was my husband's birthday, so $70.00 was taken off of our bill. The food and service was as fabulous as every time we have been there! Server was attentive, but not overly so. Everything about our dinner was at least as good as we expected and usually better.\nDon't miss out on their birthday special pricing.\nService is always some of the best you will find. Everything was cooked to perfection, the service was phenomenal, and they were more than accommodating to my variety of serious food allergies. Great place to enjoy and intimate dining experience. The food is exemplary. The Chop House is always a great time. Our service was excellent, as usual! The was good, but probably not worth the price tag. This is a special occasion restaurant. We went to the Chop House on a recommendation from a co-worker. It was my birthday, and we wanted to celebrate with a great dinner. Something to remember. The meal was excellent and the wait staff was wonderful. I ordered a New York Strip and my wife ordered a filet mignon. They were both excellent! My wife said the Lobster Bisque was amazing, best she's ever had. The service by everyone was terrific. We will definitely be coming back here when we need to celebrate a special occasion (especially a birthday, ask about it)! This was our first time visiting The Chop House. Our waiter Kevin, made us feel very comfortable, he answered any questions we had quickly and thoroughly. The rest of the waitstaff was also very polite and efficient.\nA great meal before the Christmas Pops Symphony. I took my boyfriend for his birthday & we got nice seating & great service & he loved the special touch of the 'happy birthday' message with his dessert! My boyfriend hasn't stopped talking about his time at The Chop House! We went for my daughter's birthday. The staff was exceptional and they made her feel very special. The food was good but very expensive ($149 for twin lobster tails) and the portions were pretty small. You have to purchase the sides separately as they do not come with the entrees. A baked potato was $10. Overall it was a good meal but we probably not someting we would do again. The food was prepared perfectly and despite having many tables our waiter made us feel like we were the only people there. He was knowledgeable about the food, and the restaurant. I look forward to coming back in a couple weeks with a couple clients to check out the cigar bar. Outstanding food choices, lobster bisque is perfect, service incredible. One had bone-in said it was the best he ever had, filet was great, and my NY strip was done perfectly. Highly recommend. We were in Grand Rapids for a convention. The Chop House was very busy with every table filled but still got in on time with our reservation. The crowd seemed to be both local and people from the convention. Most of the food we ordered was phenomenal! The appetizer of the sea scallops I highly recommend. The farm raised venison was rather on the tasteless side but I am accustomed to wild venison. The filet mignon was stellar with excellent flavor. The service was impeccable; informative, friendly without being smarmy, attentive, and timely. The only thing that was truly lack luster was the flavorless carrot cake; the texture was perfect but it just didn't taste like anything. One of the better steaks I've ever had and without a doubt the best steak in town and probably in Michigan. The sides are fantastic and the service matches the quality of the food. I have visited this establishment several times before and was very pleased. This time the quality of the food and service were what I might expect at a restaurant charging half the price. This may be the most expensive restaurant in town and I expected quality to match. Group of seven had dinner, reservation was originally for six and they hustled to make the seventh person fit. Food was fantastic, our main waitress was Crystal and she was phenomenal as was everyone else. Restaurant was full and the timing of courses was right on spot. Overall and excellent dining experience and highly recommend the Chop House. We went here to celebrate a recent anniversary. The food and wine list was amazing and the service was beyond exceptional. We will definitely return. We enjoyed the Chop House on my wife's birthday. We drive about 70 miles from home to the restaurant and are never disappointed. The food is fresh, service excellent and the menu is simple yet delicious. We try to make it up 2-3 times per year and have no plans of stopping that tradition. Thanks again Chop House for a wonderful meal and evening. Really was looking forward to having dinner at the Chop house, unfortunately the food was average, way too expensive for the food quality. This is not a 5 star restaurant, and the the prices were higher than the 5 star restaurants I have had the pleasure of dining in.\n If I went again I would only have a drink and an appetizer. Sorry for the delay in responding! I had a wonderful birthday dinner at the Chop House! My husband and I thoroughly enjoyed the Lobster Bisque, Beef Wellington, asparagus, and potato au gratin. Service was excellent and the atmosphere was perfect for the occasion. We really enjoying splurging at the Chop House because it is well worth it! I have been here many time, always a charmer. And after dinner head downstairs to the cigar bar!!! Hannah upstairs was amazing! The girls in La Dolce Vita were pretty awesome as well. Superb service as usual. Thanks! I went to the Chop House on my birthday with my girlfriend. We had a great experience. We had heard that you get 50% off on your birthday so we thought we would try it out. We spent $115 total including tip. The actual tab without tip would have been $143 so since I tip 20% we would have paid $175. I am one that can really appreciate fine dining, so I certainly wasn't shocked by it but even for me it's probably a little much to go back unless it's a birthday occasion with the discount. Again, great restaurant, service, ambience, experience and food - without a doubt. Just probably a little pricey for me personally. \n\nFilets were tastey - thanks!!! Since our old special occasion restaurant let us down, we decided to try The Chop House for my wife's birthday this year. The food was very good except for one bad dessert, which they took off of the bill. Little did we know that they gave a 50% discount for birthdays. A good feature since their prices are on the high side. The food and service was as expected for a steakhouse in this price range. But the smell of smoke that wafted from the cigar lounge in the basement was near intolerable. Obviously not completely intolerable as we stayed to eat. But it was a flashback to days long ago when you leave a restaurant and your clothing, etc. reek of smoke. That was the only thing unpleasant about our visit, but now that we are aware of that condition, I can say I will not return. It was amazing. Nice to see a restaurant where it is clear that the emphasis is on the customer is king. From the first cocktail to the dessert. The waiter knew the menu and made all the right suggestions. We were there to celebrate my husband's birthday and had one of the best dinners we've ever had there! Kristin, our server, took excellent care of us from timing the delivery of our courses to recommending glasses of wine! We both ordered one of the specials - filet with shrimp stuffed with lobster and mushrooms - and thought it should become a regular menu item! Will definitely return for more celebratory dinners! I ordered the bone-in NY strip and it was cooked to perfection and delicious. This was the fifth dining experience at The Chop House and every one has been excellent. Service is great and what you would expect from a high end dining establishment. It can get crowded later in the evening and occasionally odors waft upstairs from the cigar lounge. Great atmosphere, amazing food & wine, plus 50% off on food on your actual birthday! Portions are very generous. My husband and I split an appetizer, one steak, and two sides and left completely satisfied. My fiance and I came here to celebrate our engagement and we had an absolutely wonderful time. The waitress was charming and very knowledgable, the atmosphere was great, and the food was tip of the line. We were more than satisfied with everything they had to offer. Fantastic food and fantastic service. I was more than satisfied. It was the best dining experience. Excellent food, great service. Left cc there and they mailed it back to me! Thanks Blake Murray! Server was great food perfect. The manager handled situation badly when asked to change salad. He called the cops. Although cops found no issues. You get what you pay for at the Chop House. It is pricey, but the attention and quality of food/service/cocktails was excellent. Our staff went above and beyond when I asked them to surprise me with a Chartreuse cocktail and they called a bartender at a neighboring restaurant to get the perfect recipe! That cost me $17 but it was worth it. Clearly it was busy due to ArtPrize, so the Cigar Lounge was temporarily set-up as an overflow / extension of the dining room. What I had anticipated would be a nice dinner with an out-of-town guest in their very comfortable main dining room was relegated to a table in the cigar basement with a clear view and experience of all the the basement had to offer -- wine refrigerator, flourescent lights, pipes and conduit, and the thick cigar aroma, along with line-of-sight (visual and audio) to a rather fiesty bachelor party. Probably all ok if its what you signed up for, but had I know this would be the dinner ambiance, I would have made alternative plans. In short, make sure your reservation is for the main dining room . . .
My wife and I went to The Chop House for dinner for the first time. It was our 16th wedding anniversary. The entire experience was wonderful from the moment we entered the door. The atmosphere was good and the service and food were GREAT. We will definitely return again and recommend The Chop House to anyone who wants to enjoy a wonderful dining experience. My boyfriend's boss gave us a gift card to try this restaurant for my birthday. I'm so glad we went. The service was absolutely stellar and the food was amazing. The atmosphere was something romantic out of the movies. I cannot wait to come here again. Ambiance. It is a very classic romantic feel. Perfect date spot. Great food and always over delivers on expectations! Simply the best in GR! Service impeccable without being stuffy. Our server suggested wine paired perfectly with our entrees. We were quite pleased to also enjoy creamed spinach and fries (even though they were not on the menu) and a special dessert message written in chocolate sauce in celebration of our anniversary! Personal touches and a wonderful dinner! All of the food was excellent except the calamari was greasy. However, the rest was of the food exceeded expectations. Best steakhouse in town! Service and food puts Ruth Chris and any other fine dining place in the area to shame. Best of the best when it comes to the service and preperation and presentation of the food. Incredible ambience, wine list, and side dishes to go with either steak or seafood. Job well done and look forward to seeing my friends at the chop house again real soon! Great food, great people. Best steak in Grand Rapids hands down. We love the sides too. Great atmosphere. I've never had a better steak (11 oz filet). The wine list was excellent (great cab with a great steak). Given the craft beer scene in GR I felt their beer selection was lacking. Overall 5/5. Will go again. Perfect for a special occasion! The food is never disappointing. The presentation is outstanding. The wait or could have been a bit more interactive but all and all it was a pleasant night. excellent service in every way! food was tremendous! go on your birthday and the cost is very reasonable for such a quality time! Noise level was high. Not sure what you can do about that given the small restaurant size. We have been there other nights when the noise level was not an issue. \n\nUpdates to furnishings needed - the seat cushion in our booth where it met another cushion was no longer firm. To sit close or in front of the plate you felt you were leaning to the right. I had to change seating spots to sit on the other cushion which was holding its shape to not work at sitting comfortably. My husband then said he was experiencing the same feeling at that seat but managed. \n\nMeal as always was excellent. I took my wife there for an anniversary dinner. We had a great meal, our waiter was excellent as were the servers. We had time to talk and enjoyed our time there. The dessert was excellent and they took time to spell out happy anniversary in chocolate on the dish, a nice touch. I would go back again as the food and service matched the price. We were under the impression that it was 'Dressy'. We saw people in shorts and tee shirts. Not sure that fits with the price of your menu. I was dressed in Dress pants and a dress shirt and my wife was in dressy pants and a dressy top. This wouldn't keep us from coming back but was a little concerning. Great choice for a romantic evening, special celebration or date night. Wonderful service, menu selection and drink list.b save room for the creme brÃ»lÃ©e cheesecake / it's worth it! If you get a chance, ask for Crystal, you will get excellent service! Went to celebrate my birthday. Expected great food and we were not disappointed. Our server was wonderful, attentive without hovering, and thoroughly knew the menu. The portions were generous and we both had left overs! Menu is sufficiently varied. I think of it as a steak house but we both had seafood and it was great. Would definitely go there again!!!! Highly recommend it. My wife and I have wanted to eat here for a long time. We decided to splurge for our 26th anniversary. Our expectations were high with all the great reviews we read. As soon as we walked in we noticed how warm it was. We were sat within 5 minutes. After being sat it took at least 10 minutes for our waiter to make it to our table. He explained the menu and took our drink orders. He came back with my wife's drink and another 5min to bring mine. He asked if we needed time to look at the menu. He had taken so long to come to our table and get the drinks that we were ready to order right away. When he took our drink order he said we would be getting bread for us too. I ended up asking where was the bread a few minutes before the food arrived. The lobster bisque was the best. My wife's filet was perfect. I asked for my Cowboy steak medium rare and it came medium. We asked for ground pepper and he apologized for not offering it right away. A little later he also apologized for not getting the bread out right away too. We noticed the tables on both sides of us were getting great service. We still tipped very well. I guess he was having a bad night.\nI can honestly say we had better service at the Beltline Bar the week before than we did here. \nVery disappointed.\nRandy L.
Excellent food as always, really enjoy the ambiance here. Waiter was surprisingly less skilled than others here, was possibly just an off night for him. Service every other time I've gone has been outstanding. My husband and I came here for his birthday and really enjoyed our experience. He got the cowboy steak, and I got salmon, both of which were cooked perfectly. We shared a side and dessert- all of the portions were generous, and we were stuffed! It is somewhat expensive, but you get what you pay for here. We would come here again. Our Visit to The Chop House was recomended to us by a friend.\nHe said it was one of the Best restaurants in Grand Rapids..\nI tend to agree with Him.\nI had the Lamb Chops that were Outstanding and cooked to Perfection.\nThe Menu Price's are a little Pricey for our Pocket book to become a Regular...\nWe sure will be back and bring Friend's. We visited the Chop House to celebrate my husband's birthday and came away with fond memories! The entire experience was positive for us; from the greeting at the door to the wait staff and then to the dinner. We were especially impressed with the well-choreographed presentation of each course and the impeccable timing. Our meal was simply delicious from our appetizer to the wine to the steaks and the side dishes. How thoughtful to write Happy Birthday in chocolate on the dessert plate! Our waiter, TJ, did a fabulous job, was attentive without being overly zealous, and we enjoyed talking with him. We will definitely visit the Chop House in the future! Service was great. Lobster was very expensive and over cooked. I don't think the food was worth the price. My husband is a chef, and this is the best meal we have ever had. For fine dining and great food this is the place to go. We both had steak and as usual it was wonderful. We were celebrating a birthday and of course The Chop House makes it worth the visit. Everything was perfect! Coming from Chicago and having gone to many of the amazing steak houses our wonderful city has to offer, I must say this Grand Rapids restaurant really knows there stuff! All of our food was delicious. I'd definitely go back for the lollipop rack of lamb. Kim, our server, was delightful and John, the manager, was so accommodating. He picked out the perfect after dinner cigar for my husband to enjoy. They made my birthday one to to truly remember. You can'tgo wrong with this place. Harry and his staff continue to make the Chop House the best fine dining experience in Grand Rapids. It's simply the best. We absolutely adore the Chop House! The service is the best in town, bar none! Our server for the evening was Catherine. She was attentive, professional, always smiling and sweet as pie! She really made the evening flow perfectly allowing us time for cocktails and chatting before asking us to order. When we did order, she answered all of our questions and made sure we knew what portion sizes to expect. She recommended the Scallop appetizer, and it did NOT disappoint!!! :-) \n\nWe also started with Oysters and Calamari. Both were terrific! The oysters are so fresh and the calamari was as tender with a nice, light batter! We tried the Cowboy Steak and Atlantic Salmon for entrees, accompanied by Creamed Corn and Asparagus! All of it was absolutely FANTASTIC! \n\nHarry and Blake were managing that evening, and not only did both of them greet our table, but they gave us the warmest welcome! They run a tight ship, with seamless service and the highest quality cuisine, and they do it all with Midwestern hospitality and a genuine smile!\n\nJust LOVE this place! We will be back again, and again! Our service was top notch. After living in Detroit and experiencing great service at so many locations, it was great being spoiled for a night in GR. Thanks, Chop House!!! We will be back. An experience to remember. The food and service was nothing but spectacular. A romantic and special night out. Well done Chop House! We had not heard that much about The Chop House since moving here 3 years ago. We had been to just about every nice (and a few not-so-nice) places in town, but not there. so we decided to visit on out Anniversary. Wish we had gone sooner. I would say that, with Amore, this is the best place in town. We both had filets and they were both excellent in taste and perfectly done. We had Calamari and it was terrific. I had the lobster bisque and it had excellent flavor, but was a little salty. The garlic mashed potatoes and mushrooms accompaniments were well prepared and the desserts (flour-less cake and cheesecake) were flavorful and well made. We had a nice bottle of Shiraz that added nicely to the meal. If I was in NYC, I would say that the service was a bit to friendly and ever-present, but this is West Michigan, and it was very good. So, we will be back regularly. Yes, this place is expensive, but it is worth the price. Food was perfect, drinks were great andservice was even better. Do yourself a favor - go across the street and eat at Ruth's Chris. Appetizer crab and lobster cakes were okay. Ordered medium Filet - came out rare and not even warm. Sent it back. They replaced it with a new steak that was extremely dry - something I might expect from a Longhorn or Branns steak. Will never return. Ruth's Chris is so much better in all ways. Even the Chop House smashed garlic potatoes tasted like they came out of a box. Food and service top notch! We love it for special occasions. My hustand is a meat-eatter - and they have great meat. I'm not a fan of red meat, but still plenty of choices. I often get the crab and lobster cake appetizer as a main course - plenty big enough. Wish the sides were smaller and cheaper. Wine by the glass on the higher side, but can find 'reasonable' bottles. Overall, really a treat. This was a great way to try out The Chop House. With the 1/2 off food deal on your birthday this is the perfect way to try out this restaurant because of the prices. It was expensive but the food was good. Everything about our experience was perfect, the attention to detail the staff has is impeccable. The food was absolutely mouth watering as well! It's the perfect restaurant to celebrate a birthday. We cannot wait to go back. What a wonderful way to celebrate my husband's birthday! The menu provided a myriad of choices for steak as well as seafood. The wine list was amazing! Our waitress was welcoming and helpful. She was not aware, however, of our celebration even though I had made note of it on the Open Table reservation request. We enjoyed the delicious dinner served with elegance as well as the birthday dessert, complete with candle and elaborately written message. Since the servings were generous, we had our food packaged to take home. The earth-friendly containers were very appreciated. We will definitely return and have already told several friends about our experience. We celebrated my husbands birthday at the Chop House and loved everything about it! Excellent, attentive service with delicious food. The atmosphere was perfect for a cozy celebration. Enjoyable from start to finish. staff is impeccable. We went to the chop house for my husbands birthday. On your birthday you get 50% off your meal, which is great bc it's one of the most expensive restaurants in GR. but it is worth every penny!!! Had the smoked salmon appetizer which we liked but didn't love. Had the the lobster bisque which we loved! And we each had 8oz filet Mignon with mashed potatoes and Mac and cheese. First let me say I don't like pink or red steak. But our server TJ recommended I get something called medium plus which is more pink than red. He said medium well would lose the flavor of the steak. I thought I would give it a try and I loved it!!!!!! Best steak I have ever had and I highly recommend it. As for the mashed potatoes and Mac and cheese they were good but nothing special. I've heard their cheesy potatoes and creamed corn are really good. Next time we will try that. Overall a very nice place to eat. Everyone is polite and welcoming and very helpful. We will definitely go back again! Awesome service, excellent food, great atmosphere. Nothing has ever compared to this dining experience. We had a great night out, and the staff go above and beyond. Best meal I have ever eaten!! Our serer was very attentive and took extensive time to go over the menu and answer all the questions we had. This was very important to us and made us spend more and leave a bigger tip. The timing and delivery of the food was on point. Temperature and taste were superb. Happy birthday writing on dessert was an added nice touch! We will definitely dine here again! Eat at the Chop house it's very good. I like it a lot. The beef wellington was excellent, service was exceptional. I always enjoy the way everyone is served at the same time. We had an amazing time, with great food. Enjoyed the Filet and New York Strip, along with splitting multiple sides. The taste was amazing, and serving sizes were more than enough.\n\nOur server was knowledgeable, and a pleasure to work with. The steak and smashed potatoes are amazing. Our wait staff and hostess were very nice. Would definitely come back again. We have always enjoyed going to the Chop House for special occasions and it is definitely one of the top places to go to in Grand Rapids if you are looking for higher end restaurant with incredible service and food. Absolutely the most awesome experience I have had in a restaurant. This used to be my favorite restaurant downtown, but it seems like something has changed. The food and the service were subpar. From cold food to mixed up orders, this shouldn't happen when you pay $300 for dinner. The Ruth Chris across the street is looking better and better. We celebrated my husband's birthday at the Chop House on Thursday night. As usual we were treated like family. Service is the best in town and the food is cooked to perfection. We love having romantic meals at the Chop House. It is pricey but worth every penny. I would have to say of the 6 times we have been to the Chop House this has been not up to what the prior visit had been. I was mainly the food other than steaks. Still a very nice place to come to dine. We have dined at Chop House a number of times, and have always raved about it. Until now. We had reservations at 7 Friday evening and arrived at 6:30 for a pre dinner cocktail at the bar. As soon as we sat down, we both noticed the restaurant had a 'different feel' to it, with far fewer smiling staff and a certain loss of professionalism we have always before noted. \nMy wife ordered Beef Wellington, medium and I the Steak Au Poivre mediun well. We have always in the past had our food cooked perfectly to order, but Friday was a disaster. My wife's Wellington was served very rare, so we sent it back. It reappeared only a couple minutes later and it was evident it had just been thrown into a microwave for a couple minutes, so now not only was it I edible, but also very unappealing to look at. To the point my wife just said 'no thanks'. My Au Poivre was also undercooked, more to medium rare, but after the fiasco with the Wellington, I just ate what was passable for me. We were not charged for the Wellington, but did speak with a couple servers and were very disappointed that neither manager working that evening even took the time to come speak with us. Again, we have always been more than satisfied with our dining at the Chop House, but when a dinner for two with nice wine comes in at roughly $350 one should expect, and get, exactly what they order. We live both in Grand Rapids and Savannah and commute back and forth but suspect we will go across the street to Ruth Chris when we next want a steak dinner with nice wine. It truly was an unpleasant evening and experience. I cannot say enough good things about the Chop House. They are knowledgeable, courteous, attentive, well trained and execute to perfection. It will cost a few dollars to eat there but its worth every penny. We had the scallops and 8 oz filet. Both were fantastic. The lobster bisque is my favorite. Our steaks were done perfectly....great place if you want \na great steak or seafood. We went there for my birthday as my wife had been before and said the food was good. The meal was to die for.... The steak was cooked to perfection and melted in my mouth. The smashed patatos were great as was the salad wedge. The waiter was there but not really there. He seemed to arrive as if reading my mind. We had a very good experience. Great service, very polite and professional staff, best steak I've ever had. And where else can you get lamb chops for an appetizer? Plus, on your actual birthday, your bill is discounted up to 50%. Overall, there was nothing I was dissatisfied with. I surprised my husband with a birthday dinner at Chop House. It was our first time dining her and we already have plans to come back. Service was top notch from beginning to end. The food was incredible, beautiful presentation and mouth watering. We had scallops as an appetizer that were melt in your mouth delicious. The house salad and caesar salads were both delicious and well portioned. My husband had the filet and I had the NY strip, both cooked to perfection. Kevin was our server and he was excellent...well trained and knew about all options on the menu. We can't wait to come back again soon! The food and service was excellent, but the cost was at a premium. To be fair, it was some of the best steak I've ever had, and the other food was just as good, but it was over 5 times the price of what I'd regularly pay for a steak dinner. I'm not much for the diminishing returns on prices for gains in quality. That aside, it was a great meal, and the venue had the service and atmosphere to go with it.\n\nI'd recommend it for a special occasion, when you're feeling like splurging to be a bit fancy. Find a discount (they have decent birthday discounts) and treat yourself. However, making it a regular thing would be quite costly. My husband and I dined at The Chop House for his birthday and we werenât as impressed with our meals as weâve been in the past. We started with the spicy shrimp appetizer, which was amazing. Then my husband had the lobster bisque, which he loved and I had the house salad. For our entrees we ordered the filet with scallops and the New York strip, both medium rare. However, my husbandâs strip ending up coming out more rare than medium rare and the scallops that I ordered were tough almost like they werenât cooked in a hot enough pan to get that perfect sear. We would go back, but our meal wasnât everything we wanted it to be. The food is exceptional and the service truly professional. That Cowboy Steak!!!! A+ place. We ate here on 2-24-15 to celebrate my wife's birthday.\nThe service was impeccable. Our table was ready as reserved at the time reserved.\nWe were greeted warmly and our servers were immediately at our table.\nThe regular menu was supplemented by an ipad that displayed the food on the menu.\nThis is not an inexpensive place to dine but the birthday discount brings the cost down substantially.\nThe meal was served at the perfect temperatures and was very tasty. The portions are large so pick your 'sides' knowing you will not leave hungry.\nThe Chop House is a special place and certainly deserves consideration when in Grand Rapids for a fine experience. We went here thinking that this was the best of the best.\nMy wife had the filet and I had the cowboy steak, both were cooked to order and the meat quality seemed lacking. The asparagus and the potatoes were very good. Our server was very knowledgeable and made the dining experience very enjoyable.\nFor the price of the meal we expected better cuts and quality of meat. 1st time at this restaurant and very impressed. Food was fabulous, staff were friendly, helpful, and attentive. Atmosphere was elegant but not pretentious. Exceeded our expectations. The Chop House is always an excellent choice for fine dining in Grand Rapids. The food is delicious and generous. Their filet is the best in town compared to Ruth's Chris and Louis Benton. The farm fed venison chops were fantastic this week. The service also provides the best experience in town. I highly recommend the Chop House for a romantic or fine dining experience. They will also cater to many special requests such as flowers, and the cigar bar downstairs is a relaxed yet upscale atmosphere.\n\nThe pricing at The Chop House is on the higher end but it is worthwhile. The only thing I would critique is their limited liquor selection. They have a number of fine wines, but their bar is limited. We have only been here a few times. Every time is excellent. They do not disappoint! It was very nice, service was better than most. Nice decor & surroundings, beautiful woodwork and trims. Everyone was VERY WELL trained, and all very professional. The downside to that, was that they didn't interact in a friendly informal way. They were very straightforward in their work, did it well, but didn't feel relaxed.\nBut the reason I'm giving a tad lower rating, is that the cost to be there, didn't relate back to the quality of food. First you need to find parking, then pay for parking - then their pricing structure was high and rather odd. You order your steak, steak ONLY mind you (no potatoes, no vegetables, no soup, no salad) - then you can add on any of the other items, all for an added cost. I knew this was a pricey place going in, so I wasn't worried about that, but when you order a Porterhouse steak (& this steak was $49 - for the steak ONLY), then I would fully expect that this would be the most outstandingly flavorful and tender piece of meat I have EVER had - which it wasn't. Flavor was fine at most, probably should have asked for A1 (but didn't want to insult anyone), but I had some sinewy fibers in almost every bite, I had a nice pile on the edge of my plate when done.\n\nGlad we were there, nice experience, but kinda doubt if we will be back. This has been the best dinner experience I ever had. Chops is a must for repeat dinner. Excellent food and outstanding service. Well worth the cost. From the time we walked in the door, the service was amazing. Friendly greetings, prompt seating, our server gave us plenty of information and time to decide. She wasn't over-checking on us so we had time to celebrate and chat. Wonderful food with a perfect amount of time between courses. We had a great experience and will be back. Mu husband and I chose The Chop House to celebrate our 24th wedding anniversary. The service provided by server Catherine and the rest of the staff was outstanding and the food was marvelous. It was made an extra-special occasion by the special treatment of our dessert. WE love this place! We very much appreciate the birthday discount to bring this fine establishment into our budget range for a treat night out. We know we can rely on them to make us feel welcome. My husband loves the interactive ipad menu. And the steaks are poetry. We visited Tues Jan 28 for my wife's birthday. Our server Tim was very knowledgeable and attentive. We had a wonderful time and will return again. Grilled shrimp was spongy and tasteless. My fault for not ordering meat but I like seafood. Great Steak!! We go every year for my husbands birthday as he enjoys the steak-best around and the birthday deal is wonderful! ( half-off food) I am not a steak lover so i always get the grilled romaine salad. This year it was not up to par. The romaine was soggy and the flavor just wasn't there. We ordered sides of garlic smashed potatoes and grilled asparagus. The potato side was good but the portion was\n smaller than the year before and the asparagus was tasteless and tough. my wife and myself had never been to the chop house as Ruth Chris was our usual steak house. On one concert night Ruth Chris was filled so we elected to try Chop house. I feel the atmosphere and food does not compare to Ruth Chris and the Chop house prices were just as high or higher. Our table was near the kitchen and way too many people were always around or walking by us. I would not go back to the Chop House for a steak dinner as the food was just OK.
Second time I dined and considering the first was exceptional, I did not think they could top it. The food is amazing, start to finish, prepared perfectly, tastes fantastic, presented beautifully. The service is 2nd to none from the moment you walk through the door, everyone is professional, friendly, attentive, efficient. Our server Hannah was great, she answered any and every question, made great suggestions and was generally delightful. I can't wait to go back. Very good food for a very high price. Perfect time to go is on a birthday to get the discount. The dessert was the best part of the meal. Hors d'Ouvre was great.. Caesar salad dressing was very tart and too citrus-ey...told the waitress this and it was acknowledged by the floor manager that he had taken care of it in the kitchen. Pork chops & sides were great. Beef Wellington was way under cooked and came to table cold throughout...plus, there was no pate evident. Unless this dish is fixed, would not recommend it. Dessert and coffee were great. We were there on a MON night and perhaps the First Team in the kitchen was not fully present...in general, we enjoyed our meal but for the two items mentioned above...both of which were acknowledged by the wait staff and floor manager and neither of which were we charged for. I was a little disappointed with the tenderness of my steak as was the two other people I was with. The flavor was excellent, but if I'm paying almost $50 a piece for a steak it better melt in your mouth. I had he New York strip and my wife had the cowboy steak. You had to chew a lot with both cuts of meat. I can get a very tender cowboy steak at the Crazy Horse restaurant in Holland for half the price. My New York strip was just as tough. I must say however the flavor was excellent. The ambience and service were outstanding, but I felt the quality of the steak was a real disappointment. I would not recommend getting a steak to a friend. Hard to hear the people at your table when the restaurant is full. You feel like you are screaming at the waiter and the people you are with at dinner. Expensive but worth every dollar as we celebrated our Anniversary. Food and service unmatched anywhere in Grand Rapids. Great ambiance as well. We came for a birthday- so the birthday person's meal was 50% off. Waiter was great, he was friendly and recommended a great bottle of wine. Lobster bisque was delicious, as was the wedge salad. Cowboy steak was very good, filet with blue cheese was good- but blue cheese was a tad overwhelming. Side order of asparagus was blah, side order of mushrooms was delicious. Did not have dessert. The Chop House is always a great experience. We went here to celebrate my birthday on this occasion. The server was friendly, attentive and effeciant. The food is always good. The appetizers where hot and tasted wonderful. The soups and salads came out at the perfect time. The entrees were hot, great quality and good size portions. This is a great establishment that never disappoints. We celebrated my dad's 70th birthday there, since it is his favorite restaurant in Grand Rapids. Service was top notch, we had a lovely private 6-top. Great wine and delicious chocolate cake prepared by the pasty chef for the occasion. The only small complaint was that two steaks were switched (person who ordered medium got medium rare and vise versa) and my steak was medium rare instead of medium. Corey was fantastic waiter. Food was great although my husbands first steak was very grisly. Immediate attention by Corey and manager. A new steak was promptly brought out and it was perfect. Overall wonderful experience. The Chop House did not disappoint. I requested to sit in a particular area in my reservation and that was immediately accommodated, the service was flawless & the food was amazing. There is no better restaurant in Grand Rapids! Our waiter was Nick. He got busy with another table and had Kevin help him out. Kevin came to ask us about needing boxes and if we needed anything else. Kevin was an awesome wait staff. If and when I come back I will ask to be sat in Kevin's section. He handled his tables very professional. Nick, well he was average runoff the mill. Could work at Wolfgangs and would still be just an average joe. \nI had a great experience. It was not because of Nick. All of us had steak of different variites and they were all outstanding! The Chop House continues to put out great food and wonderful service. We have visited the restaurant many times and this week was as consistent and enjoyable as ever. We visited Mondy to celebrate my wife's birthday with my 17 year old daughter. Our waiter was fantastic, providing excellent service and recommendations. The dining room was busy on a Monday night, yet everything went very smoothly and timely. The Chop House never disapoints. We have always had fantastic meals at The Chop House and love the wine pairings on the great menu. Food and wine quality are both wonderful. The service was excellent as well. We return often, especially on special occasions. Steaks were good but should have been better for the price. Ordered mine medium rare and there was very little juice from the meat. I'm sure it was just an off night as I have always had great food at the GRCH. This is my second time in the Chop House. The scallops were delicious. The chop salad was just ok for $22. The smashed potatoes were amazing. The NY strip was blah at $44.\n\nThe sommelier recommended an okay bottle of wine for $94.\n\nIt is a good restaurant if you have the money to throw away.\n\nWe celebrate Bdays here because of the discount which is a great deal. Other than that, I dont think we would go if we had to pay full price. My wife and I celebrated our 25th wedding anniversary at the Chop House in Grand Rapids, MI. Very good food, excellent service. Nice wine selection. Highly recommend it. My wife and I love dining out and have been to many nice restaurants over our years together. Outside of a VERY hi priced meal we had in Vegas this was the best experience we have ever had! The only thing better than the food was the pampering and service we received. This is a must try place and if Tesha is available as a server get her!! John, our server, hit it out of the ball park. And what a pleasure to see Blake in his new role as the Dining Room Manager! The gentleman knows his wine! We enjoyed the atmosphere and the service was outstanding. Our waiter was present just when we needed him to be, every time. The filets were cooked to perfection, with Oscar style lobster a perfect addition. The lobster bisque was the best I have ever had. You get what you pay for and this was well worth the price. We could become frequent diners at The Chop House. The service was outstanding. The steaks are excellent. Better than Ruth Chris. Great bar and good drinks. The only disappointment was the wine list. Too few wines by the glass, almost no half-bottles and a limited selection of bottles. \nWe will come back. The Chop House continues to be one of the reasons I visit Grand Rapids at all. Fantastic experience all around, and I continue to appreciate the transition from dinner to after-dinner downstairs. It makes for a great night. The staff is very well trained. They make sure we 'enjoy' every minute. 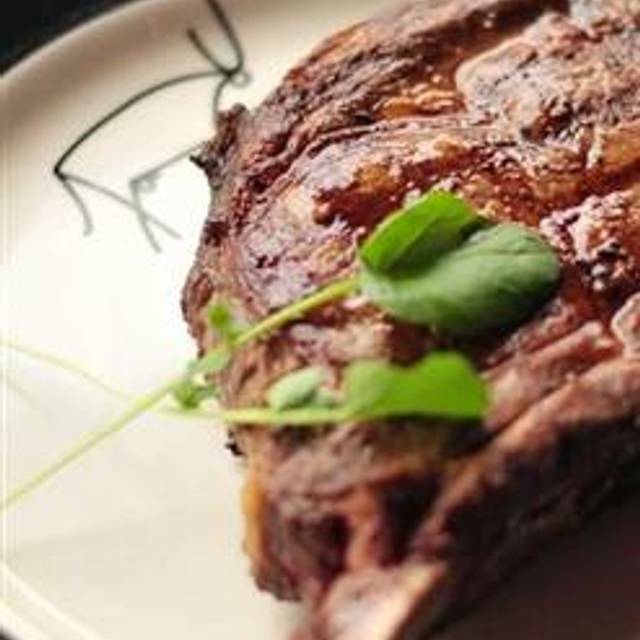 Reserve a table at The Chop House - Grand Rapids in Grand Rapids on KAYAK. View information about The Chop House - Grand Rapids to help decide on what to eat. On KAYAK you can also explore 5 photos and 449 unbiased real reviews about The Chop House - Grand Rapids.